Experience the wonders of Victoria Falls or combine a stay at the Falls with Botswana’s Chobe National Park. While spending 3 days in Zimbabwe, take a guided tour of the breath-taking Falls and a walk in the rain forest, plus enjoy a sunset cruise on the Zambezi River. On the longer stopover and after spending 2 days at Victoria Falls, explore Botswana’s Chobe National Park, famous for its elephants, taking game drives in open safari vehicles and a cruise on the Chobe River. 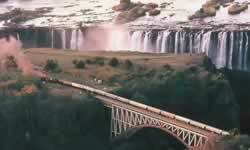 After breakfast take a guided tour of Victoria Falls, and then a walk in the Fall’s rain forest. In the late afternoon enjoy a sunset cruise on the Zambezi River. 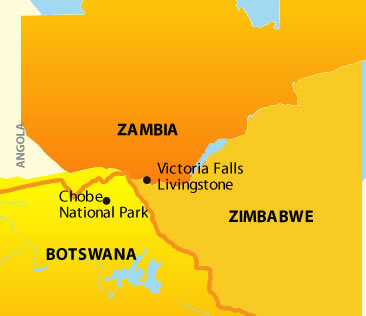 Transfer by road to Victoria Falls Airport for your return flight to Johannesburg (flight included). Maximum baggage is 23kgs per person. Business class airfare is available (additional cost). Taxes and fuel surcharges are additional ($300USD per person). Rates are subject to change with/without notice. Accomodations: Package price based on combination of lodges in M = Moderate, FC = First Class or D = Deluxe categories.